Read about the first week here. Read about the second week here. Read my first session Gospel Slam piece here. This post is REALLY late, and I apologize–it’s been busy around here! Worship at Mt. Olivet Baptist Church: Seeking to get out of their comfort zones, the Samplarians attended Mt. Olivet. The Rev. Dr. Charles E. Booth, the Senior Pastor at Mt. Olivet, is a friend of TLS and serves there as an Affiliated Professor of Homiletics (Preaching). The Samplarians were not used to the attention they received–as first time visitors, they were invited forward to meet Dr. Booth in front of the entire congregation, and everyone around them welcomed them with open arms. The worship included lots of singing, dancing, clapping, joyful exclamations, and fiery preaching. Three hours in, the Samplarians had to leave for their next engagement, but none of them ever felt bored! German Village: Schmidt’s Sausage Haus and the Book Loft. What more needs to be said? Sunday afternoon was spent consuming Bahama Mama’s, spending too much money on books (maybe that was just me), and a side trip to Pistacia Vera for some macarons. One last visit to the Bexley Pool for an afternoon of fun in the sun rounded out the Samplarians’ final weekend together. Luther Memorial Camp: For those who had been to summer camp before, this was a return to their childhood. For those who had never been, it was a new experience. The Samplarians split up between different camp groups and helped them play games, have Bible study, and, most importantly, eat lunch! They also had the chance to talk with Jenny, one of the leadership staff members at Luther Memorial, and to hear her story of faith and discernment. Class with Dr. Joy Schroeder: The Samplarians’ final professor was Dr. Schroeder, the Bergener Professor of Theology and Religion with Capital University and Professor of Church History (academia loves long titles!). Class this week focused on martyrs and saints–what makes a saint? Who were/are martyrs? What does this mean for us now? Saying goodbye to Seth. Photo by Mike Hanck. Used with permission. Ethiopian Lutheran Church: One of TLS’s international students is Bishop Teshome T. Deingede, a member of the Ethiopian Lutheran Church Mekane Yesus. Bishop Teshome spoke about the history of his church, his own personal story, and the work that Mekane Yesus is doing in his country. Shepherd’s Corner: It was time to get back outdoors! The Samplarians drove out to Shepherd’s Corner, an ecological ministry project of the Dominican Sisters of Peace. Shepherd’s Corner models how to live ecologically-minded and, true to its Dominican foundation, is an educational center. They grow chemical-free produce (65% of which was donated to local food pantries last year), raise animals naturally, restore and protect the ecosystems on their property, and more (the llama that guards their sheep, Fernando Amigo, has his own Facebook page!). The Samplarians were given two tasks: one group got their feet wet and helped to seal the bottom of a new pond with clay, and the other spent the morning shoveling a winter’s worth of sheep manure out from their winter stall. After lunch, everyone enjoyed a peaceful, meditative walk through Shepherd’s Corner’s prayer labyrinth. Gap Year: What does one do in the time in between education and occupation? That’s what the Samplarians learned about from two presenters, including our very own counselor, Mike Hanck. They heard stories about traveling around the world in the Peace Corps, serving in the Lutheran Volunteer Corps, Americorps and living in a L’Arche community. They talked with the presenters about what made them decide to take a “gap year”, why they chose which paths they did, and how they changed as people. Each presenter was clearly moved and inspired by their experiences and encouraged the Samplarians to explore their “gap year” options. Weeding! : Having just heard about “gap year” opportunities, the Samplarians worked at the YWCA of Columbus with an Americorps volunteer who specialized in gardens, agriculture, and environmental science. After an introduction to the work the YWCA of Columbus does with the homeless, the Samplarians were put to work in the YWCA garden pulling out weeds, planting seeds, and trimming bushes. They were taught the importance of strategic planting, raised beds, and constant garden monitoring. After working in the hot sun for a few hours, they broke just in time for the weather to change and shower cool rain on the results of their labor. Artistic Presentation: The Samplarians spent an evening with Carol Whitt, a local artist. This presentation was interactive–they didn’t just hear about art, they actually got to make some! A Day at Wittenberg: Piling into the van, the Samplarians headed across the state to visit Wittenberg University, a university affiliated with the Evangelical Lutheran Church in America. The day began with a visit to “Un Mundo Cafe”, a project originally started by Wittenberg students to help raise money for the local children’s charity. Then they visited Ferncliffe Cemetery, taking time to walk around the graves and meditate on the realities of life and death. They enjoyed a tour of Wittenberg’s campus and time with some local community and university mentors. At the end of the day, the Samplarians stopped by Young’s Dairy for dinner, mini-golf, the driving range, a chance to pet the animals, and, of course, ice cream! 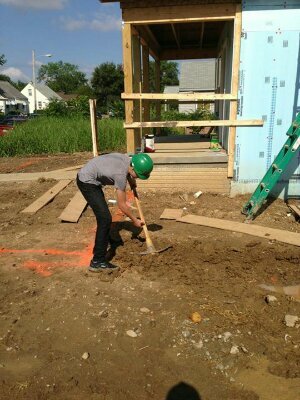 Building a Better Home: The last service project of the session was also the most physical. 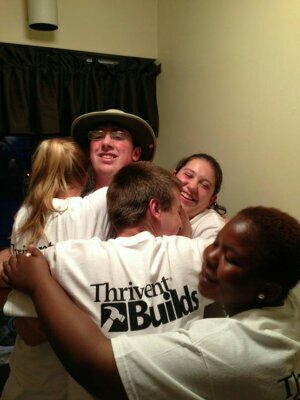 Partnering with Thrivent Builds, the Samplarians lend their hands and their strength to a Habitat for Humanity project. Some wrapped a garage in Tyvec, discovering along the way that geometry was not their best subjectsubjects taped and sealed insulation on the outside of the house, and still others dug ditches for drainage pipes. At the end of the day, notable progress had been made, and the Thrivent Builds team expected that the house would be finished by the end of the summer. Louis digging a drainage trench. Photo by Mike Hanck. Used with permission. Closing Worship: On the final night of Summer Seminary Sampler, the Samplarians held a closing worship service. They presented gifts to each other as part of the service. The gifts were as varied as the Samplarians themselves: one played everyone’s favorite hymn on the piano, another brought homemade snacks, a few sang songs, etc. It was a long night, but a powerful night in which everyone got to say good bye to each other. On the following morning, Pastor Joe joined the Samplarians again to finish the service, presiding over a small loaf of vegan-bread and botle of wine in a last Eucharist. After cleaning out the apartments and scrubbing the floors (which, by this time, were in dire need of a good scrubbing), the Samplarians parted one by one, picked up by parents or taken to the airport, to return to their own homes and communities of faith. Posted on 15 July 2013 by Pastor KenPosted in Seminary LifeTagged Christianity, discernment, ELCA, Evangelical Lutheran Church in America, Gospel Slam, habitat for humanity, Lutheran, service, shepherd's corner, summer seminary sampler, Trinity Lutheran Seminary, youth ministry.